« Day 204 in Beijing: Don’t Stand. Don’t Stand. Don’t Stand So Close To Me! Day 205 in Beijing: Human Feet. It’s What’s For Dinner. Jill and I tried being fish food again. 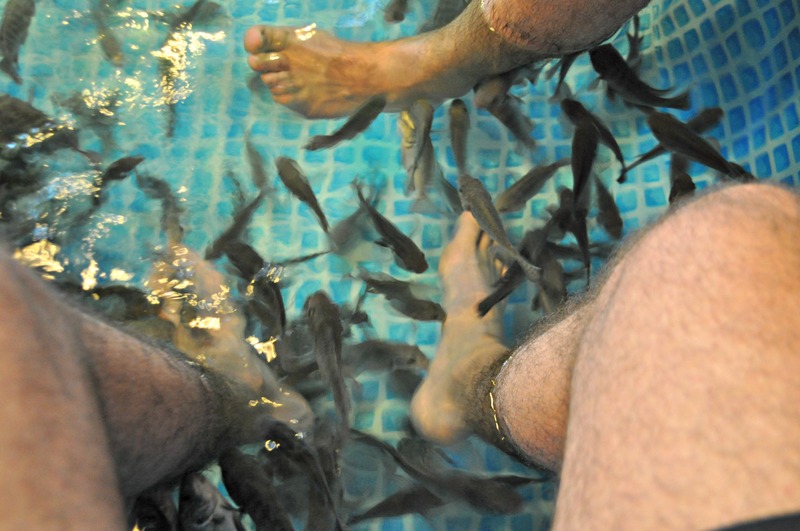 You may remember that we did the fish feet food dinner when we visited Shanghai a few months ago. 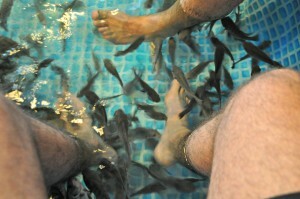 They were tiny little fish that, when they ate the dead skin off our feet, made us laugh because it tickled us so much. These guys were more like big fish that were really looking to be fed. They didn’t hurt but it wasn’t as ticklish. It took about 15 minutes, and cost about 3 dollars US, and it was well worth it. Not only do our feet feel so much better but the looks on the faces of the people walking by, and their questions, was worth way more than we paid. People tend to be pretty freaked out by this and I can’t really blame them. It is a pretty strange thing to do. I know that in China one can actually wear a swimsuit and go into the water up to their necks and have the fish clean off the dead skin from everywhere that is not covered. I’m not sure if I’m up to that experience yet, but trust me, if I do, you will hear about it here on my blog first!